Summary: There are people in this world who are Nobody. No one sees them. No one notices them. They live their lives under the radar, forgotten as soon as you turn away. Review: We all feel like nobody every once in a while, but what if you found out you actually were Nobody? That is what Claire must come to terms with in Nobody. Claire and Nix are two great main characters. They, as we learn throughout the book, are Nobodies, people who no one really notices. But while Nix has grown up knowing he is a Nobody, Claire is just learning it. I enjoyed Claire's journey into realizing what she is, Nix is so sure of what he thinks and when Claire's existence tears that all apart their resulting journey is both complex and interesting. I like books that are semi-grounded in reality but have a cool scientific twist ad Nobody definitely has that. I loved learning about the Institute, the Nobodies, and the Nulls. Barnes has painted a picture so real that I was getting shivers thinking about the possibility of Nulls existing and about real people who are basically the real life equivalent of Nulls. The way the book is written is kind of strange. Instead of alternating between characters each chapter. The chapters are broken up and they go back and forth between Claire and Nix. After a little while I got used to it but it is different when you first pick it up. 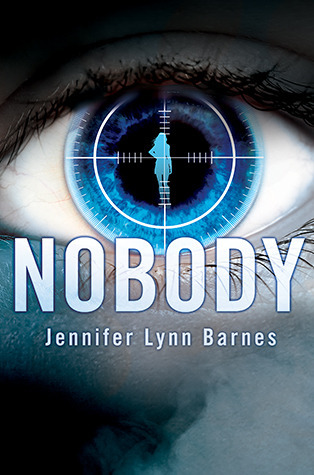 Overall I liked Nobody and am looking forward to the next one. If you would like to win a copy of Nobody along with Jennifer Lynn Barnes' standalone Every Other Day fill out this Rafflecopter form! I'm excited to read how exactly someone can be seen as a Nobody. Interesting. I've been marathoning Alias and Nikita on Netflix recently, and Nobody sounds like the book version of those shows. I can't wait to read it! It would be scary ot have a Nobody around especially if they are assassins. The storyline is intriguing. Thanks for the giveaway!! I have been wanting to read these books for awhile! I would seriously love to get my hands on these! I have heard o many amazing things about JLB novels, so thanks for the chance to win them!! Gosh, this one sounds so awesome. I just LOVE Jennifer Lynn Barnes's books!